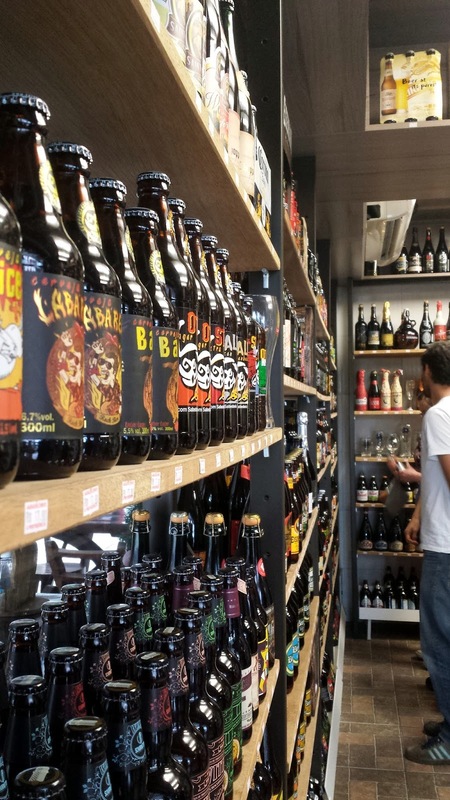 As an American it can be easy to think of good beer as being exclusively brewed in Europe and former English colonies. You might think that every other country has a local generic ultra-pale lager, and not much else… That may have been almost-true 20 years ago, but not any more! Ronaldo emailed me late last year to ask if I was interested in presenting at the second annual II Congresso Técnico da ACervA Catarinense a homebrewing conference held in Florianopolis, Brazil. 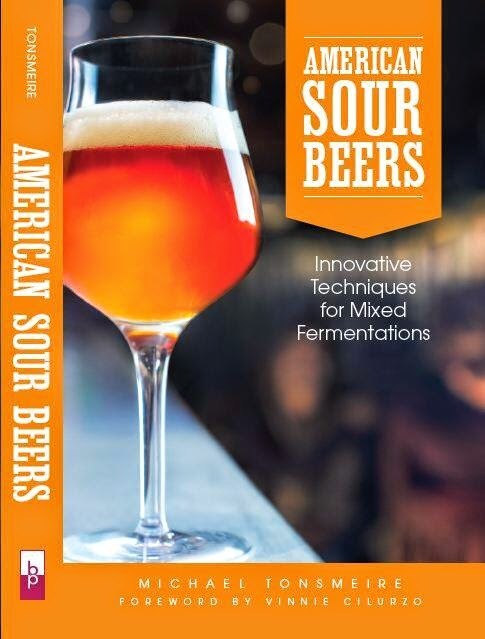 I chatted with Stan Hieronymus, who had attended the first year (incorporating the experience into his review of American Sour Beers), and he spoke highly of the hospitality and experience. Once I talked Audrey into it, I agreed to go! Being a relatively small city in southern Brazil, reaching Florianopolis from the US requires several flights, so I wanted to extend our visit as long as possible. 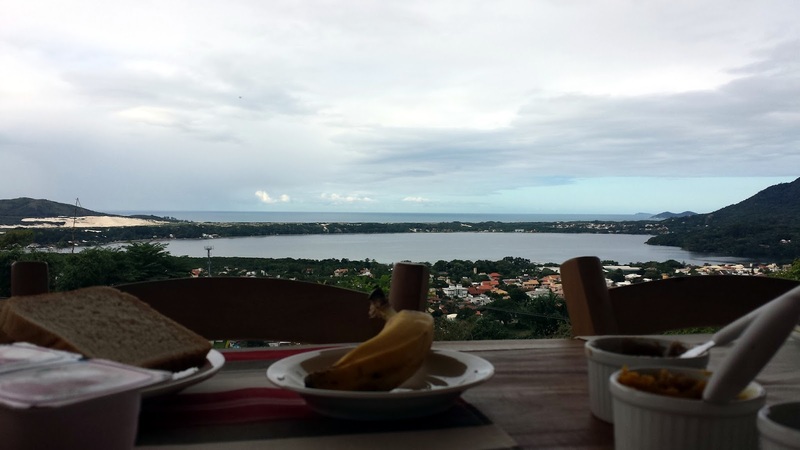 Neither of us had been to South America before, but rather than jump around between cities, we decided to have a more stationary-relaxing trip. Audrey and I arrived Sunday around 4 PM, by way of Miami and Sao Paulo. We’d left DCA the previous night around 8. Florianopolis is a relatively wealthy city with a small airport. We were told taxis are perfectly safe, but were still happy to be greeted by Ronaldo and a few more smiling homebrewers outside security. We spent the next three days visiting beaches, eating interesting (sea)food, sightseeing, and drinking local beers (it was funny to see Omnipollo and Evil Twin collaborations on the shelf at the local supermarket). Our bed and breakfast (pousada) was up on a hill with a gorgeous view of the island's lagoon and the Atlantic Ocean beyond. Breakfast the first day included delicious cheese made by the owner’s father, along with eggs, ham, fruit, jam, and bread. Wednesday Denny Conn and Drew Beechum arrived. I’ve been aware of them practically since I started brewing, but we'd never met. Denny is known for his simple approach to the brewing process, combined with dedication to perfecting recipes (like his Wry Smile Rye IPA and Bourbon Vanilla Imperial Porter - I've brewed batches based on both). Drew is known for his prolific writing and brewing, especially unique projects and recipes (e.g., Methode Champenoise for Beer). Together they wrote the engaging Experimental Brewing. In person they were even more entertaining than they are when writing. The final member of the American contingent was Scott Bickham, a BJCP judge pulling double duty administering an exam as well as speaking. The night they arrived we had one of the best meals of the trip, at a Portuguese restaurant with fantastic octopus rice. The next day was probably the longest and most memorable of the trip. 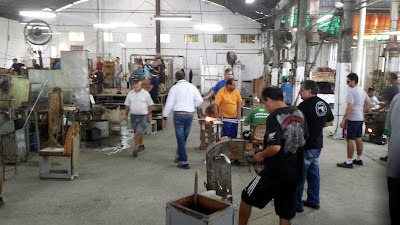 It started with a bus ride to a glass factory, Cristal Blumenau (where we got to blow our own glasses). The glasses (the ones we didn't blow anyway) were beautiful, and the experience felt practically medieval. OSHA takes all the fun out of American factory tours! Denny and Drew have many more pictures on their website (including my glass-blowing face). 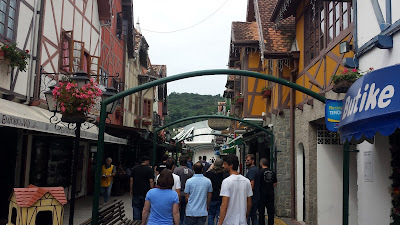 After that excitement, we had a hearty lunch at Bier Vila in Blumenau. The city was previously home to the world’s second largest Oktoberfest outside Munich. We tried one of the local "specialties," Chope de Vinho (wine-beer): essentially pale lager sweetened with sticky-sweet wine. We were told that despite not being marketed or publicized in any way by the brewery, it represents a significant portion of their sales. Followed by a stop at the well-stocked beer store one door down (there were a few 750s from Brooklyn Brewing prices for the equivalent of more than $100). 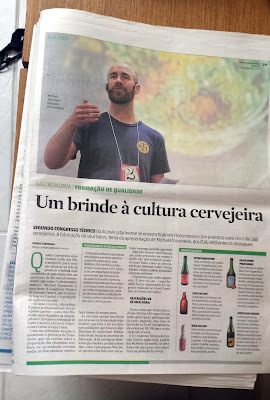 Back on the bus to the local brewing school (Escola Superior de Cerveja e Malte) for a tour. Then onto Cervejaraia Bierland for beers and a tour. The strong German heritage in the area around Blumenau at least partly explains the interest in good beer in southern Brazil compared to the rest of the country. While we drank several Vienna lagers (Bierland's is particularly clean and malty - the brewery staff wore white aprons and hairnets) and Pilsners, there are also many breweries producing Belgian and American inspired beers. For example I grabbed a bottle of Tupiniquim Frutas De Jardim - Amora (a beer with Brett and blackberries). 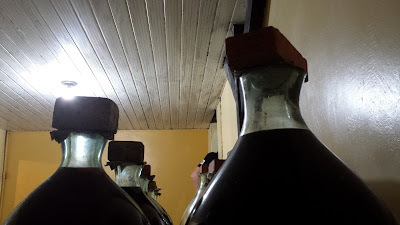 The last stop of the day was for a cachaça (sugar cane liquor) tasting at Du Pipe a funky little distillery on the edge of the rain forrest. There were some bats living above the barrels, I got a weird rash on my ankles from wondering off the path, but the homemade sausages were delicious! Finally the long bus ride back to the city, and a couple slices of Mafioso pizza before crashing. The conference itself started Friday. I was impressed by the knowledge and excitement of so many of the homebrewers who attended. Translation was handled simultaneously, via headphones. This extra bit of equipment allowed me to speak more naturally than if I had to wait for translation between each sentence. It also made answering questions seamless (I wore the headphones for that). I was impressed how much effort and thought had gone into the conference! I was also surprised to see my picture in the local paper the next day (article)! The “cocktail” reception following the first day was really eye opening. I thought that the beers were as good as most American homebrew club meeting I've attended. Sure there was one butter-bomb, and another was too fruity-sweet for my palate, but overall they were fun and delicious. I was especially excited to try some beers brewed with Brazilian fruits and woods (amburana – adds a cinnamon and chile-like spice). Sadly southern Brazil doesn’t have the huge variety of fruits that the more tropical latitudes in the north provide. It was interesting seeing the differences in "standard" equipment as well. There were some corny kegs, but also lots of small sanke kegs (a result of relatively inexpensive Chinese-made imports). Rather than standard ice-cooled jokey boxes, most of the beers were served through plug-in refrigerated taps. 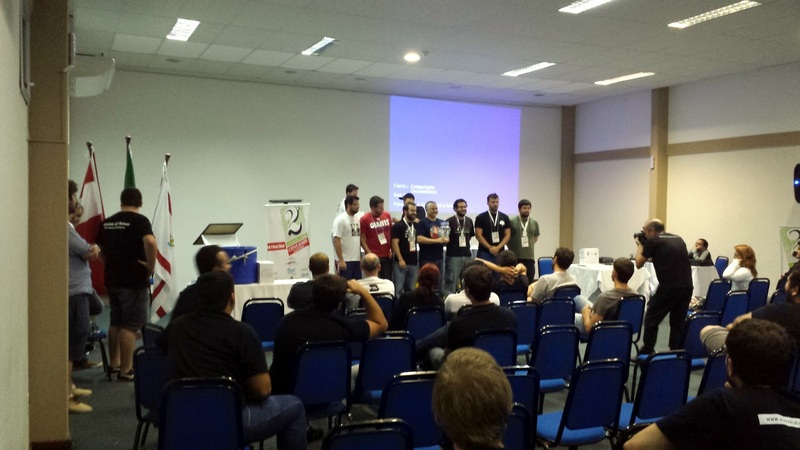 It was enlightening to hear about the different hurdles Brazilian homebrewers face. Sourcing hops was one of the biggest. While malt ends up being a similar price to what I pay, high quality hops have to be ordered directly with high shipping costs. There is a local yeast lab, but many strains that aren't available locally are passed around between brewers. I was especially impressed by the beers shared by the guys from Random Nano (including sours, and a stout with mushrooms), and a few bottles of sour beer sent down from a homebrewer (Rodrigo) in northern Brazil. It is always fun being a guest at events like this because brewers go out of their way to bring their best batches! In general I thought the weirder ingredients were really well balanced in most of the beers I tried. Our last full day in Florianoplis we visited Cervejaria Badenia, a German-style brewery (run by a couple Germans) where we had some delicious lagers and local smoked trout with horseradish. Then onto a classic roadside churrascaria, where meat is brought around and lopped off onto your plate. Most of the cuts were relatively familiar, but a few like the hump of the Gyr Indian cattle (which tasted like pot roast) were new to me. With a few hours off we dashed over to the mall to get suitcases for Denny and Drew to haul home all the glassware, bottles, and souvenirs they’d picked up (still not sure how all ours fit). Then off to Ronaldo’s house for more meat, homebrew, book signing, and group photos with the smaller local homebrewing club. 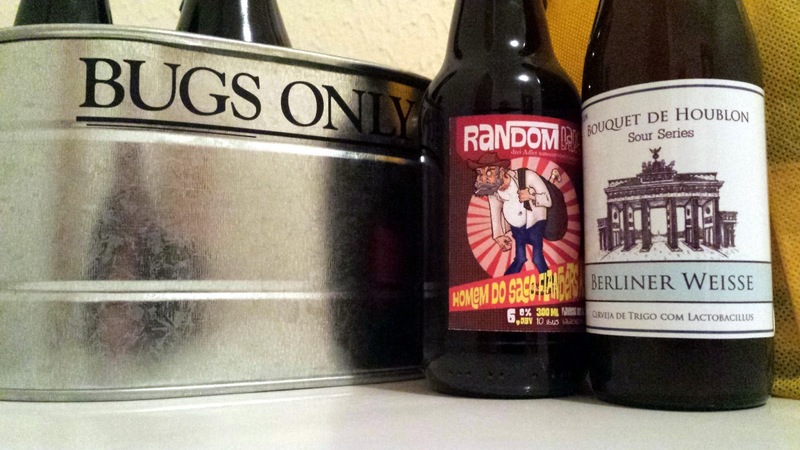 Luckily the two bottles of homebrew I brought with me survived the trip, and seemed to live up to the expectations. I was hesitant to agree to go when I was invited – which is my initial reaction to being asked to do just about anything – but much like summer camp, friendships formed quickly, time flew by, and I was sorry to be heading back to DC when the time came. 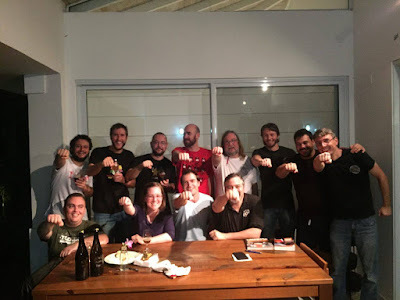 A special thanks to Ronaldo, Rafael, Júlio, Gabriel and everyone else who drove us around, shared beers, bought/made us food, and went out of their way to make it a fantastic experience! Luckily some of them will be at NHC in San Diego in a couple weeks, so hopefully I’ll be able to repay some of their hospitality! Sounds like a great trip - thanks for sharing! Are there any cervezas brazilianos to watch for in the US? Wow! Excellent read! I was recently abroad, and was equally astounded at how much beer and homebrewing was engrained in culture. Excellent read! No really interesting Brazilian beers make it to America regularly as far as I'm aware. Most of the interesting breweries are really small.